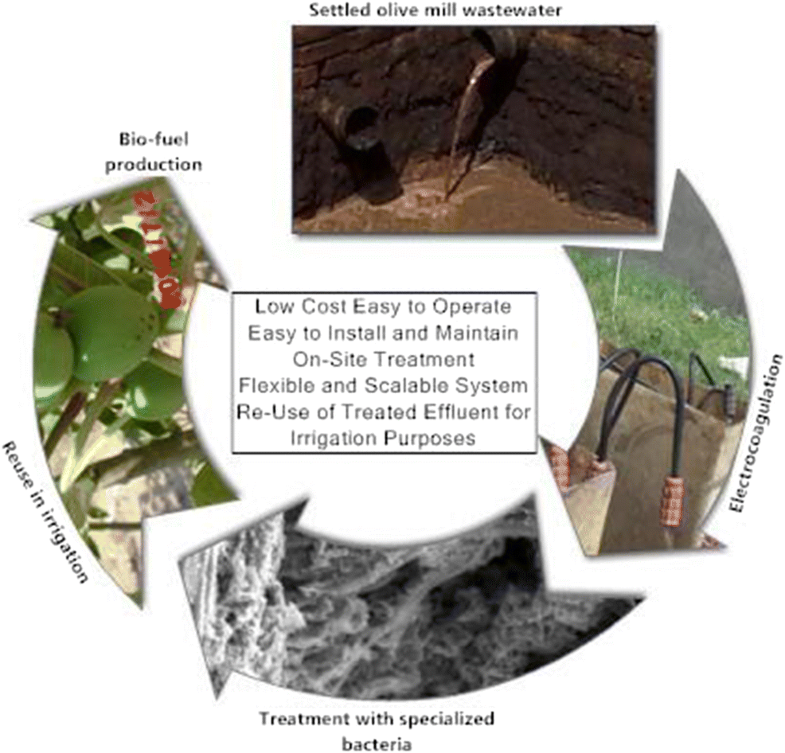 A consortium of highly degrading microorganisms was used in an integrated bioaugmentation/electrocoagulation process for treating olive mill wastewater. The system was investigated for treating 1 m3 day−1, at a pilot scale, for 2 years; hydraulic loading rate and organic loading rate were 2880 l m−2 day−1 and 37,930 g COD m−2 day−1, respectively. Average removal efficiency for COD, oils, and total phenols was 63.9%, 85.2%, and 43.6%, respectively. The olive mill consortium, OMC, consisted of seven actinomycete strains. The strains were confirmed, by 16S rDNA analysis, to belong to five Streptomyces, one Kitasatospora, and one Micromonospora strains, at 100–99.06% similarities. Hydrolytic enzyme activities of OMC strains were remarkably higher for degrading cellulosic and lipid constituents (enzyme-cumulative indices, 14–16.1), than the phenolic constituents (indices, 4.1–6.5). The establishment of actinomycetes in the treatment system was indicated by their increased counts in the biofilm at the end of the biofilter, reaching 13-fold higher than that in the control bed. The treated effluent was toxic to the seedlings of Jatropha curcas (Jatropha) and Simmondsia chinensis (Jojoba). Though its application in irrigation of 3-year-old Jatropha shrubs, significantly, enhanced the fruit yield up to 1.85-fold higher than the control, without affecting the seed oil content, after 3-month application, the irrigated soil showed insignificant changes in its biochemical properties. This developed bioaugmentation/electrocoagulation process can treat wastewater with extremely high organic strength, while its approximate construction and operational costs are limited to 0.03 and 0.51 US$ m−3, respectively. It produces a treated effluent that can be reused in irrigation of specific plants. • A pilot-scale system for treatment olive mill wastewater with extremely high organic strength. • It integrates electrocoagulation and bioaugmentation with seven native actinomycetes. • COD (63.9%), oil (85.2%), and phenols (43.6%) were removed. • Recycling of the treated effluent in irrigation of Jatropha curcas shrubs. • Insignificant changes in biochemical soil properties after 3-month application. • Approximate construction and operational costs are limited to 0.03 and 0.51 US$ m−3, respectively. The online version of this article ( https://doi.org/10.1007/s11356-019-04893-w) contains supplementary material, which is available to authorized users. 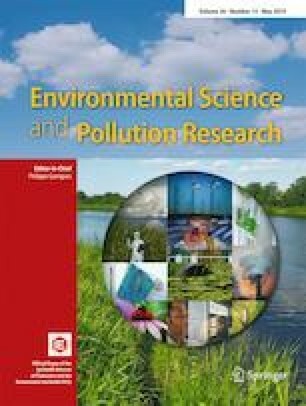 The authors acknowledge Centre of Environmental Studies and Consultants, Suez Canal University, Ismailia-Egypt, for providing the Laboratory facilities. Thanks to Mohamed Eddeeb, Technical sector, Concord for Engineering & Contracting, Cairo, Egypt and Raúl Riesco, Department of Microbiology and Genetics, Edificio Departamental, University of Salamanca, Salamanca, Spain, for their valuable assistance in the data analysis. This work was supported by the Science and Technology Development Fund, Egypt (Project 5945, 2015).